Whats the difference between a regular winter cover and a Loop-Loc Safety Cover? 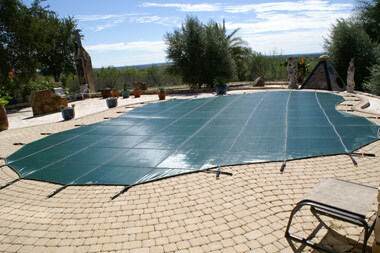 A typical solid vinyl pool cover is little more than a tarp to put over your pool. It does not prevent children or pets from gaining access to the pool. Loop-Loc is a winter safety cover that gives your back yard a clean look and will stay in place. All safety covers must conform to the Standard Performance Specification set by the American Society for Testing and Materials (ASTM). According to the ASTM, a safety cover must be able to support a certain amount of weight, not permit gaps that a child or pet could squeeze through, and remove standing water. LOOP-LOC safety covers far exceed minimum ASTM standards, however. Built from extremely strong material and secured tightly to the deck by heavy-duty springs and brass anchors, a LOOP-LOC safety cover puts a lock on a pool that will prevent children and pets from gaining access to the water. A Loop-Loc winter safety cover can be specially made to fit all inground pools and most above ground pools! Safety is a priority and to make sure yours is here before the winter season starts, ask us how you can order one today! Want to keep your family, pets and pool safe? Click here! Watch Bubbles, the baby elephant, stand on the Loop-Loc Winter Safety Cover! Strength & Safety for your family and your pool!